since we don't want to fall off the new year's resolution bandwagon, we're teaming up with chobani to "crunch the numbers" and dedicate ourselves to living life a little lighter in the new year, and we want you to join us! you don't have to make any drastic changes, try starting with 100 fewer calories per day! here are 12 easy and fun ways to burn 100 calories . . .
i love the idea that i can burn 100 calories by dancing around the kitchen for 20 minutes, and another 100 calories by cooking for 34 minutes! i've mentioned before that my whole family loves yogurt, especially greek yogurt, and we are huge chobani fans. 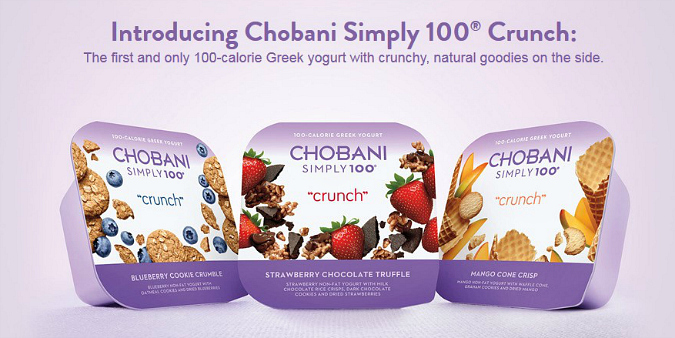 so, we are excited to help chobani celebrate the launch of their new simply 100 crunch yogurt which is the first and only 100-calorie greek yogurt with crunchy, natural goodies on the side. this new line of naturally-sweetened greek yogurt is full of flavor and satisfaction for only 100 calories. made with natural, non-GMO ingredients, it's an ally in your weight-management journey. they are an excellent source of protein and fiber, and they have less sugar than regular fruit yogurt. i'm a big proponent of eating healthily, so i read labels closely and i carefully watch what i put in my body. be sure that you know what's in your cup of yogurt. other greek yogurts on the market use potassium sorbate as a preservative (which is used to kill bugs) and sucralose as a sweetener (which has chlorine added to it). no thank you! join us and start 2016 off strong! I do enjoy Chobani. I have not tried the crunch. I will check the sugar amount vs the one that I eat and maybe give it a whirl. I like the info chart on how to burn those extra calories. I better start working at it.